In their attitudes toward modern society and their relations with people of other faiths, U.S. Muslims sometimes more closely resemble other Americans than they do Muslims around the world. According to a 2011 Pew Research Center survey, about half of U.S. Muslims say that all (7%) or most (41%) of their close friends are followers of Islam, and half say that some (36%) or hardly any (14%) of their close friends are Muslim. By contrast, Muslims in other countries nearly universally report that all or most of their close friends are Muslim (global median of 95%). Even Muslims who also are religious minorities in their countries are less likely than U.S. Muslims to have friendships with non-Muslims. For example, 78% of Russian Muslims and 96% of Thai Muslims say most or all of their close friends are Muslim. 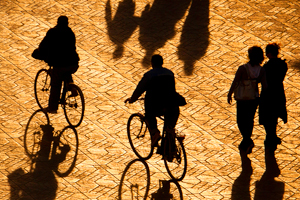 A majority of U.S. Muslims (56%) believe that many religions can lead to eternal life. Most Americans (65%), including nearly two-thirds of American Christians (64%), share this view. 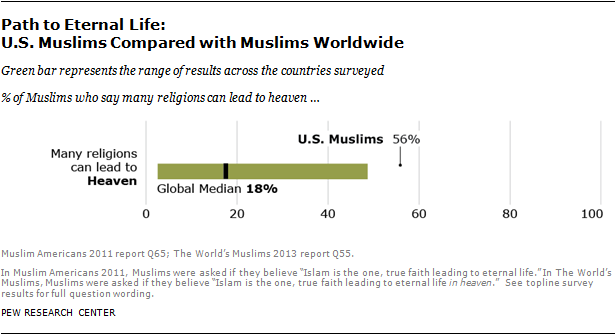 Across the world, however, this attitude is far less common among Muslims: a median of just 18% of Muslims worldwide think religions other than Islam can lead to eternal life. Most U.S. Muslims (63%) say there is no inherent tension between being devout and living in a modern society. A nearly identical proportion of American Christians (64%) agree. Around the world, somewhat fewer Muslims (global median of 54%) share the view that modern life and religious devotion are not at odds. The picture is more complicated when it comes to matters of science and religion. Roughly six-in-ten U.S. Muslims (59%) say there is generally no conflict between science and religion. Globally, about half of Muslims (median of 54%) agree. But among U.S. Christians (39%) and the U.S. general public (37%) smaller shares view religion and science as generally compatible. On the question of evolution, U.S. Muslims are split: 45% believe humans and other living things have evolved over time, while 44% disagree. U.S. Muslims are about as likely to believe in evolution as U.S. Christians (46% of whom say they believe in evolution). 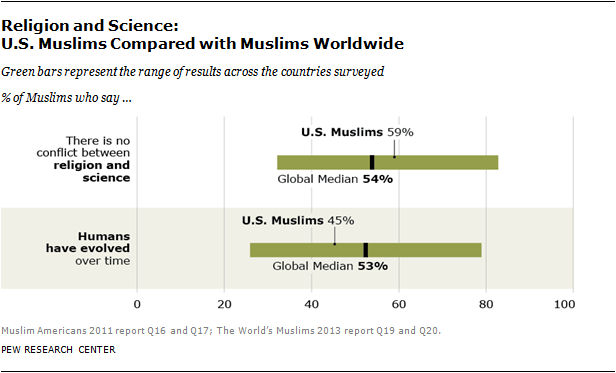 But Americans overall (52%) as well as Muslims worldwide (median of 53%) lean more clearly toward accepting evolution. Download selected questions and results from the 2011 and 2007 Surveys of U.S. Muslims PDF (30 KB, 2 pages).